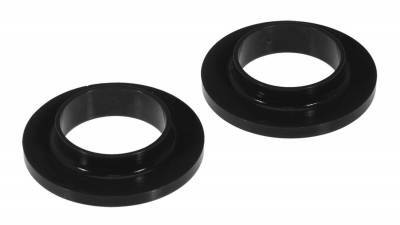 An item that is often overlooked when replacing worn coil springs on your muscle car is the coil spring isolators. Spring isolators see a lot of abuse over their lifetime from road debris, mud and water. Over time they will crack and begin to deteriorate leaving the coil spring to sit metal to metal against the spring pocket causing wear of the pocket and possible noise during the range of motion of the suspension. PSTs coil spring isolators are made from our famous Polygraphite. With our Polygraphite material there will be no more deterioration from the environment and the graphite impregnated poly ensures years and miles of quiet use.